Research in the Willis group is focused on developing new catalytic methods to meet the demands modern science places on synthetic chemistry. These can involve being able to produce specific molecules more quickly, in fewer chemical steps and with the production of less waste materials than ever before. The ability to prepare molecules never before synthesised, or to deliver many related structures with only minor adjustments to the synthetic method are also common goals. To achieve these aims we are involved in the development of new reactions, new asymmetric processes and new strategies for synthesis. Summaries of several areas of research within the group are provided below. The publication section provides further details. Sulfur dioxide has a long and interesting history as a regent in organic chemistry, but presumably due to safety concerns its use is almost absent from the recent chemical literature (and laboratories). That a variety of sulfur dioxide derived functional groups, such as sulfonamides, sulfones and sulfonates are present in a large number of biologically significant molecules makes this even more surprising. 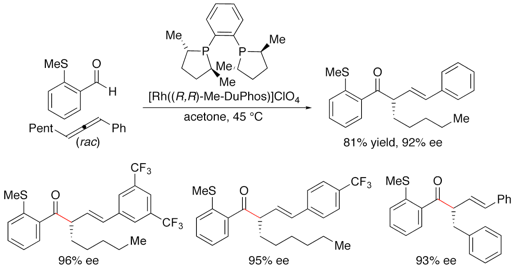 In 2011 we reported the use of a solid, stable and easy top use sulfur dioxide surrogate – DABSO – and have been exploiting this reagent in a variety of new catalytic processes. We have exploited the simple combination of the electrophilic DABSO with nucleophilic organometallic reagents and utilized the in situ generated sulfinate intermediates to deliver sulfones, sulfonamides and sulfoxides. 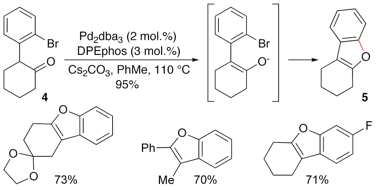 We have also reported a number of new catalytic methods for sulfur dioxide incorporation, including a palladium catalysed aminosulfonylation reaction, and new sulfones syntheses. We have been interested in developing asymmetric versions of cross coupling processes such as Suzuki and Stille reactions using enantioselective desymmetrisation procedures, and initially focused on the reactions of meso-ditriflates such as 1. We have shown that in order to generate an active and selective catalyst, monodentate hemilabile ligands such as MeO-MOP should be employed. For example, treatment of ditriflate 1 with the indicated boronic acid, palladium acetate, MeO-MOP and cesium fluoride at room temperature results in the production of the coupled material in 66% yield with an enantiomeric excess (ee) of 86%. This is the first example of an intermolecular enantioselective Suzuki cross coupling that generates stereogenic carbon centres. We are currently employing desymmetrisation strategies in a number of total syntheses, including an approach to the natural products hodgkinsine and calycosidine. We are in the process of applying our palladium-catalysed desymmetrisation methodology to the enantioselective synthesis of heterocyclic systems; this required the ability to use Pd-catalysis to construct N- and O-functionalised alkenes. Accordingly, we have demonstrated that both enamines, isolated as the corresponding amines, enamides, and enol ethers can be successfully prepared from alkenyl triflates and tosylates using Pd-catalysis. This new enamine synthesis can be combined with Pd-catalysed arylation to provide a new route to indoles. For example, carbon backbone 2 containing aryl bromide and enol triflate functionality is coupled with aniline to provide N-aryl indole 3 in excellent yield (Scheme 2). The process was optimized to allow access to a variety of medicinally interesting N-aryl indoles, however, as shown below, a variety of substitution patterns can be accessed. Scheme 3 shows how Pd-catalysed intramolecular enolate O-arylation can be used to provide access to a variety of benzofuran systems (4 5). We have continued to explore the synthesis of a variety of heterocyclic systems, based on the use of tandem C-C, C-N and C-O bond forming reactions; quinazolinedione, quinalone and benzofuran syntheses have been reported recently. We are interested in the development of a synthetically useful intermolecular hydroacylation reaction; such a process is inherently atom economic, involving adding the elements of an aldehyde across an alkene or alkyne. There are two key features to the project; the first is to design a series of synthetically useful chelating aldehydes that are capable of stabilising the crucial acyl-rhodium intermediates. The second is concerned with identifying functionalised alkenes that can be used in the hydroacylation process. We have also shown that chelating aldehydes can be used directly in hydroacylation reactions and have found that the use of sulfide-substituted aldehydes such as 6 allows hydroacylation to proceed (Scheme 4). Thio-acetal-substituted aldehydes are also excellent substrates for similar processes. Key to the success of the system is the formation of stablised acyl-rhodium species 7. The mild reaction conditions, high yields and functionalised substrates employed in this system make this one of the most synthetically useful hydroacylation reactions reported to date. We have recently begun to explore the utility of chelated Rh-acyls as hydride sources, and the development of second-generation catalyst systems. Having established that we can achieve efficient hydrocylation reactions across a variety of substrates, we have recently begun to explore the development of a catalytic enantioselective process. Our first generation system employs disubstituted allenes as substrates and proceeds via a dynamic kinetic asymmetric process to deliver hydroacylation adducts with up to 96% ee (Scheme 5). This catalyst-controlled process represents the first example of highly enantioselective intermolecular hydroacylation. The publications section gives a good indication of the ongoing research interests of the group.